With this adapter, you can stream video and audio from your Laptop to your monitor / projector / TV with HDMI port, and charge your laptop by using the type-c port.You can easily share movies with your friends on a larger TV/monitor/projector. 1. HDMI port: Output formats up to 4K x 2K (3840 x 2160) 30Hz, down compatible with 1080P, 720P, 480P and more. 2. USB C 3.1 Type-C F Port: Can charge Type-C computer through Type-C female interface, 5W-60W automatically adaptive.Only upward supply power to the main TYPE-C output equipment, NOT downward. 3. 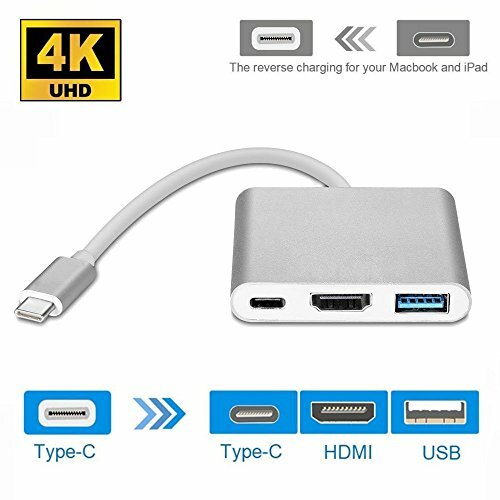 Easy operation: plug and play, no extra driver is needed.Can connect U disk, hard drive, mouse, keyboard with transfer data rate up to 10 Gbps.Type-C to HDMI 、USB-C、 USB3.0 3 in 1 Hub Adapter for Apple Macbook. 4. Support Device: Macbook (USB Type-C) OS X system, Chromebook Pixel. 5. Note: Please plug in again if product appears unstable. USB C to HDMI Adapter: The USB 3.1 Type-C to HDMI+USB3.0+Type-C/F Charging Adapter helps you connect computer with type C port to a display monitor/HDTV/projector with HDMI port and other devices with USB3.0 port. USB 3.0 Type A Port: To connect devices such as your USB flash disk, mouse, keyboard, camera, removable hard drive, HDD or a USB cable for syncing and charging your smart phone or other devices. Plug and play, no extra driver is needed. This portable Hub Provides USB 3.0 port, HDMI port and TYPE-C port, enables you insert three devices simultaneously.